Productivity: There's No App For That! To be honest, when I first started getting asked this question I was always taken off guard. I did not have a good answer and fumbled over my thoughts and words to produce one. I used many different apps that aid productivity but I didn’t have a true favorite. How could I not have an answer though? I was, after all, The Productivity Specialist. So I was determined to “find” the best productivity app in the marketplace. I found my answer and am eager to share it with you. Then I asked myself, “Which of these apps make me productive?” The answer that swelled in my throat was, “None!” Can you believe it? None of the “productivity” apps I use make me more productive. But how could that be if they were all touted as the best productivity apps on the market? Trying to solve my dilemma, I further asked myself, “What do I want to accomplish with an app that would make me more productive?” I came up empty handed again. How could that be? The answer was actually simple and stems from the fact that I do not define productivity the same way as most people. This means that despite what you may have heard, productivity is not the same as being organized. You may hear of “productivity experts” who equate being organized with being productive. Wrong! We’ve all met super organized people with super clean desks who are nowhere near super productive. This also means that, again despite what you may have heard, productivity is not the same as being efficient. “Productivity experts” also like to equate being efficient with being productive but they’re wrong again. 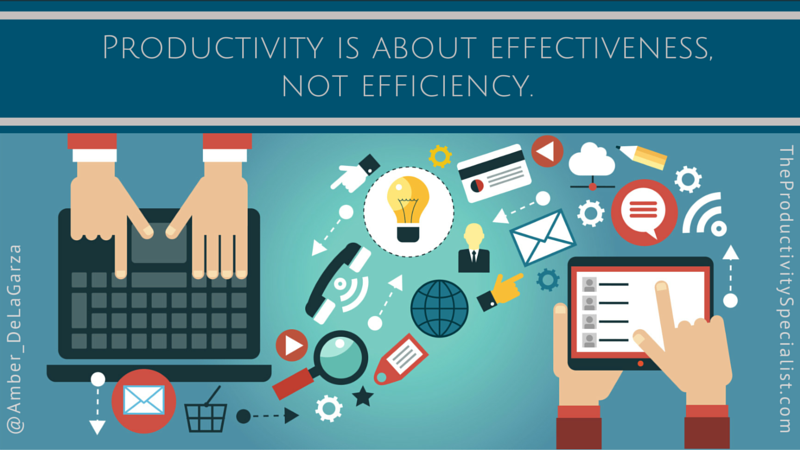 Productivity is about effectiveness, not efficiency. Being organized and being efficient can help us be productive, but they do not make us productive. Investing your best time, into your best activities. We are all unique, as are our goals, our vision of success, and how we plan on achieving them. So how can we put ourselves in a box and say that productivity is a one-size-fits-all solution that an app can solve? We can’t! Only you can decide what your best time is and what your best activities are based on your individual goals and vision of success. There are numerous apps available that will you save time, make tasks easier, track your progress, help eliminate distractions, efficienize (I do have a favorite made-up word) systems, and organize your tasks and emails but at the end of the day, it’s a matter of personal decision. 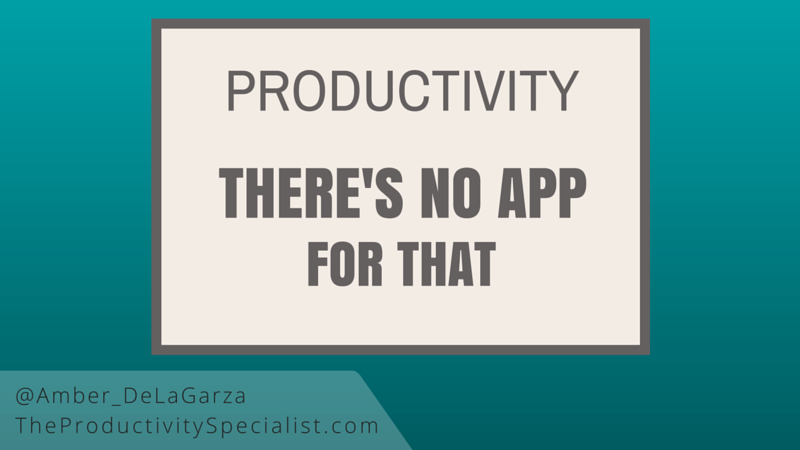 You are the gargantuan variable in the productivity equation and there’s no app for that. Because productivity is an ongoing process, you have to take responsibility for making the decision to be productive consistently. That’s what successful people do! They make the right choice and choose that path over and over again. 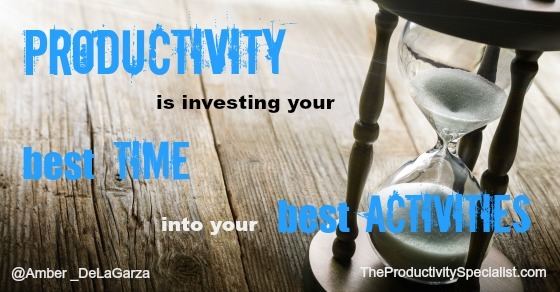 To be productive, you simply have to invest your best time into your best activities. That’s true productivity. Today when I am asked, “What’s your favorite app to be productive?” I reply, “There’s no app for that!” No app can magically make you a productive person. You have to make the choice to be productive and then make that choice again and again, day after day, hour after hour. No one said success is easy. Quite simply, there’s no app for that! Commit to making the daily choice to be productive by “Investing your best time, into your best activities.